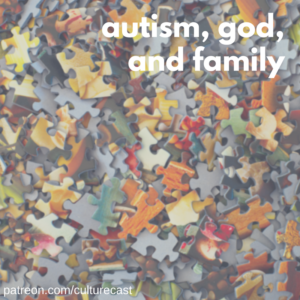 In this week’s episode, Christian and Amy talk about autism, families, and ableism in the church. Their son, Mattias, who is on the spectrum, comes on the podcast to talk a little bit about what it’s like being on the spectrum, some of the challenges he faces, the most difficult moments in his life, what has changed, his experience in a new school environment, and about the time he told everyone in his class about being on spectrum. Amy and Christian also share their perspective as parents and ask Mattias to share a little bit about his talents and what advice he would give parents of kids with autism. Christian also talks with Nathanael Welch, producer of the CultureCast and Homebrewed Christianity podcasts, about life with a sibling with austism. Nathanael shares about his brother Benjamin, who is profoundly disabled, when he first noticed Ben was different, the shifts in identity that took place as a result of growing up with a disabled sibling, the struggle with resentment,and how his experiences taking care of Ben have changed the way he sees the world, other people, and God. Learn more about Benjamin’s situation here. You can help support the CultureCast! Just go to patreon.com/culturecast. If you become a patron (at any level) by May 5th, you will be entered to win a set of 3 Common English Bibles (the Study Bible, Women’s Bible, and Storyteller’s Bible). So sign up to support the podcast now!